Until now! Almost 20 years later! 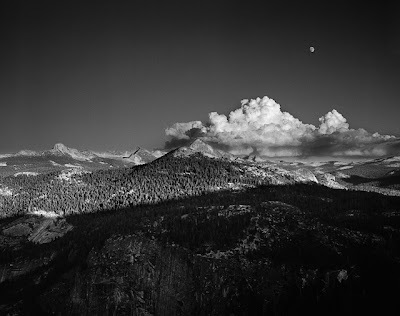 This image, "Moonrise, Glacier Point, Yosemite NP, CA," was made in September 1989. I had rented a house in Carmel for a month and took a side trip to Yosemite with my friend Alan Grossman. Neither of us had ever been there before, so we were both awestruck to say the least. One day, we had heard there would be a good moonrise up at Glacier Point, elev. 7214 ft. We figured out what time we had to be there and were set up a little early. I made a few negatives, this one being the widest view. 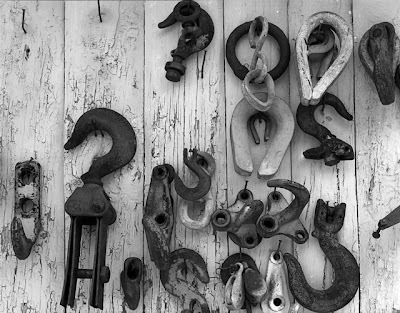 The negative looked nice, but the contrast range was so immense that I could never print it, and it went into a box for 20 years. Fast forward to 2008. I had the 4x5" negative drum scanned at 4000 dpi. The file is 650MB. I did all my Photoshop work, cleaning up all the remnants of my less than pristine processing from my early days, and working to even out the huge contrast range. First I worked on the shadows in the gorge in the foreground. Then I worked on the area in the midground with the pine trees. Then the distant landscape, the clouds and the sky, in order. I think the image came out fairly well... much better than any version I had ever attempted (and discarded) in the darkroom. My plans for this image are twofold. 1) Make a new silver 4x5" negative from my file that I can print in the darkroom, no larger than 11x14". 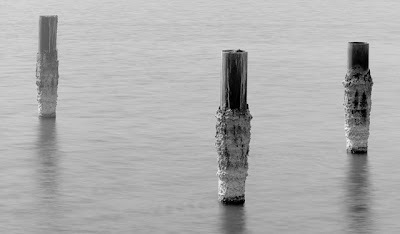 Or maybe an 8x10" negative for contact printing only. Not sure yet. 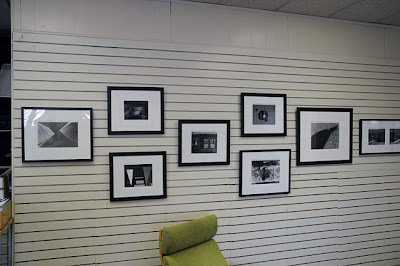 2) Make a very large inkjet print, up to 40x50" and see what that looks like. When I have attempted each, I will post my results. We went to the Mustang Library in Scottsdale a few weeks ago to get some books for my daughter. I had never been to this branch but was immediately struck by the entry to the library. There is some renovation construction going on, but this seems to have been part of the original design and structure. I checked the time and decided to come back the next day at the same time. First for all the ladies who let me get away... here's the other woman! While we were waiting for everyone to meet back up later in the day a few of us went up about 20 feet of stairs to an outdoor park where there was a hippy family picnic going on. They were, of course, as intrigued by our cameras as we were of them. 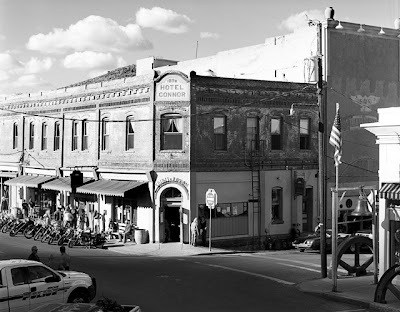 This image is looking down on the main drag in Jerome where there was some sort of biker festival going on. 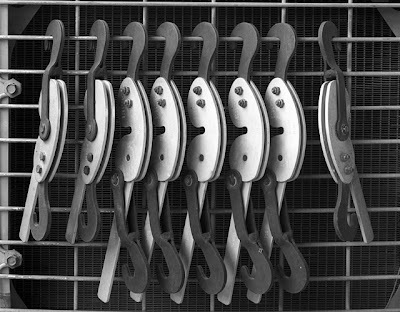 I was developing new film last week and I needed HC-110 rather than my usual T-MaxRS. I only had two sheets of 8x10 so I figured I'd go into the "vault" (actually an old Tri-X box) where I keep old film I never got around to developing. I took the first sheet off the top and decided to throw it in the Jobo drum with the other film. Well, it turned out to be a negative from August 6, 1989. 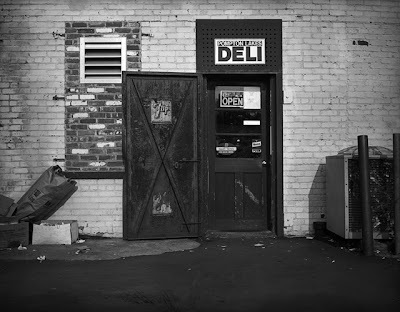 It was an image of the back entrance to the Deli in Pompton Lakes, NJ, where I grew up. This was where we would park our bikes and go in the deli to get all the sustenance a young boy needs... Cracker Jax, Beer, Sandwiches.... it was often the jumping off point for a fun night, usually sitting on the railroad bridge drinking beers. Oh, those glory days! Oh, back to photography... even though the negative has been sitting in a box for almost 20 years it developed pretty darned good! Can't wait to print it! Or to get to the other hundreds of old negatives sitting in even older boxes! To boldly go where no man has gone before! Well, maybe not NO man. The second part of my trip back from Los Angeles was the Salton Sea. I had never been there before, but had seen many hauntingly beautiful photographs of the Sea and its surrounds. The history of the Salton Sea is a very interesting read. For those who have not heard of its history, here are a few good places to start. Salton Sea Restoration and Salton Sea Historical Chronology. Upon starting down the East side of the lake I was greeted by an F-16 (I think) doing some pretty tricky hi-speed, low-altitude maneuvers over some Prime Time Pepper fields. Then you come upon the marina... North Beach Marina to be exact. There's an abandoned club/restaurant that is now a White Pelican refuge. I have never seen so many pelicans before... and have never seen a white pelican either. The air is very pungent with the smell of salt and decay. It was also very humid. The Sea is currently 227 feet below sea level, putting it on par with Death Valley. I also saw the largest flies I have ever seen... easily an inch and a quarter long. Anyway... I made a few photographs with the 8x10 and 4x5 but didn't focus as precisely as I should have... the excitement of this alien world completely discombobulated me. 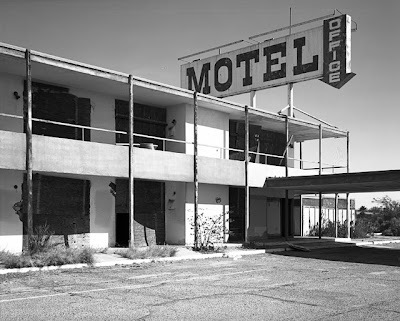 Next, I went across the street to the Motel. This reminds me of a cheap sci-fi movie, and who knows... it may have been in one. 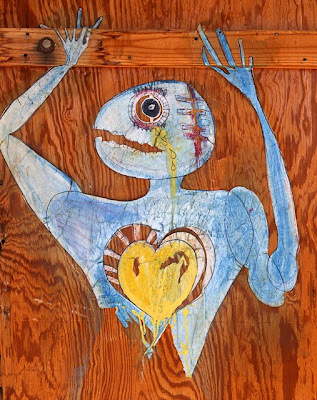 Made one image with the 8x10 in black & white, and then, as I was taking the 8x10 down and getting ready to leave I noticed this painting on a piece of plywood covering one of the doors or windows. I was drawn to it mysteriously, as if it was telling me to come and photograph it. Kind of reminds me of a Star Trek alien. But this alien is crying and has a broken heart... maybe he was left here by his shipmates and they never came back for him. Maybe his girlfriend dumped him... who knows. 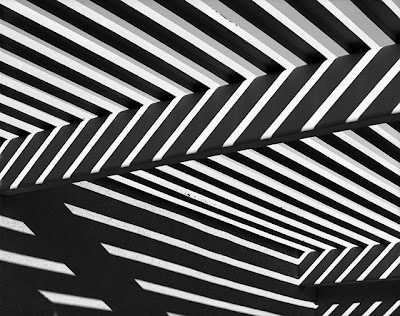 The sun was directly hitting the face of the Motel, but the second floor walkways were keeping the top of the first floor in beautiful shade. I ran back to the car and got the 4x5 and color film. Thanks again to Rod Klukas' color zone system, the chrome came out perfect. 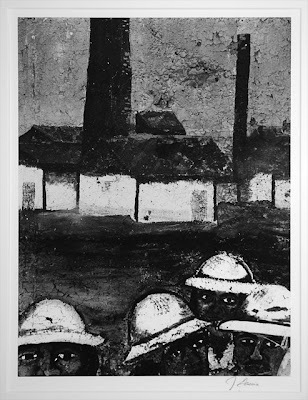 This image reminds me of my friend Juan Garcia's images of the mining murals found throughout Arizona mining towns. As I was running out of time – and had no more 8x10 film left – I pointed the GPS home and it took me through Box Canyon. Another place I have to go back to. An hour or so later I was back on Interstate 10 heading East. 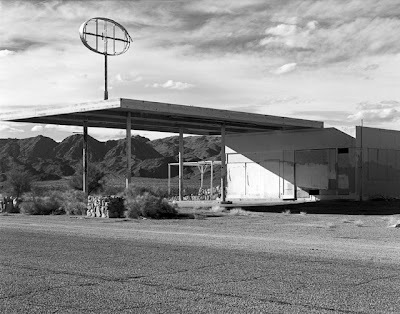 There is an abandoned gas station in Desert Center, CA on the north side of I-10 along a parallel road that I had seen before and been wanting to photograph. Desert Center is another one of those places that time has forgotten. If you have ever driven west and seen a bunch of chopped off palm trees... that's Desert Center. There's a General George Patton Museum there and not much else. I went on the underpass to the road on the other side of the highway and set up my 4x5. I made the image in black & white and in color. Tough to say which one I prefer yet. I made the black & white image with a yellow filter to darken the sky, lighten the shadows and separate the tones in the background mountains. As I was setting up this car comes speeding down the street and parks right where the gas pumps used to be. I had already taken the color image and was changing up for the black & white. Slowly she pulled forward out of my field of view, thankfully. But, she then got out of her car on the cell phone and was looking at me. Then she pulled this 35mm with a long lens on it and started taking photos of me. I don't know what she was thinking, but all I wanted to do was photograph the building, and I was on the other side of the street, I-10 property. Anyway, I finished up and didn't look back. The only thing I can think of is that the building is now for sale... I'm sure it will be sold VERY QUICKLY out there in the middle of nowhere! Which reminds me... I had wanted to photograph it looking northeast, but the for sale sign was on the left side of the bay so that was out. So I had to photograph it facing northwest. At that time of year and that time of day, a better image anyway. Back onto I-10 East to Phoenix... 3 or 4 hours more and I was home. 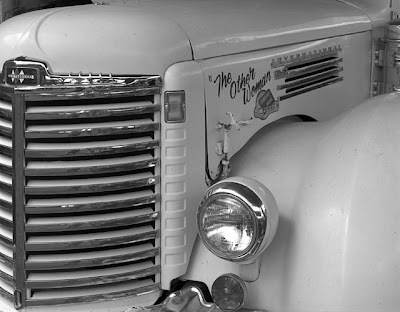 Next post... images from Jerome, AZ and Superior, AZ... both field trips from Rod Klukas' large format class. 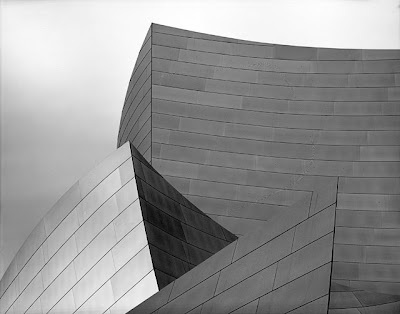 I know that ALL Frank Gehry buildings look the same and that this building has been photographed by EVERYONE... but I love the curves and the sheen on this building. 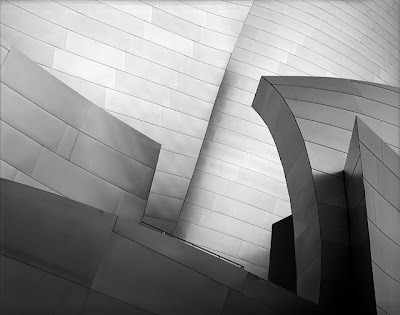 I recently went to Los Angeles on business and I decided that on the way back home I would photograph a few places I had been wanting to. 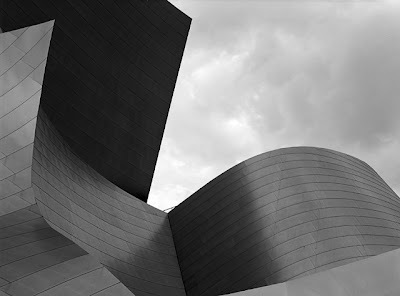 One of them is the Disney Concert Hall. We had been there on a family vacation last summer and took the tour. Even got to see the organist practice. But, I only had my DSLR. So, this time I brought the big boys... used the 8x10 on these four shots. They day started miserably. I set the alarm for 5:30 so I could shower, check out of my hotel and be at the hall by 7:00 AM. Well, the alarm went off, and then a rain storm started at 5:31. I hit the snooze and went back to sleep. 15 minutes later the rain stopped. I jumped in the shower and hitailed it out of there. I arrived and had the camera set up by 7:30 AM. Just as I was about to expose the first sheet, the guard came out and told me that no professional photography was allowed of the building without consent. I told him I was not a professional. Then he said something about Union rules... I told him I was not a member of ANY union. Then he told me I was on private property and I was more than welcome to photograph from the "sidewalk". If you have never been here... the sidewalk is about 50 feet from curb to building. There are NO demarcations as to where the private property meets the public right of way. He basically pointed "somewhere over there" near the curb. I went about 8-10 feet from the curb and asked if here was OK... conveniently there was a seam there. He said fine. So I recomposed my shot and changed from the 300mm to the 450mm lens to make up for the distance. Anyway, took 3 more shots toeing the line and was on my way by 9:00 AM – by now the sun had become a problem anyway. 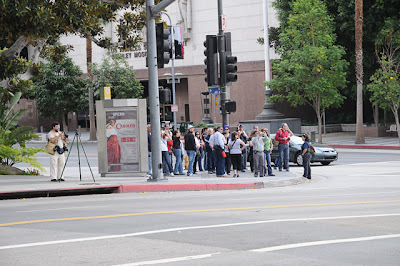 Now, as I was packing up I noticed a "mob" of "photographers" across the street. They all had point-and-shoots and cell phones. I guess there was a walking tour or something. There was also a "pro" there, but not part of the group. 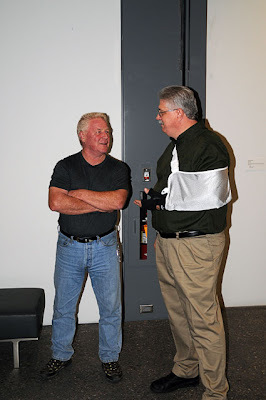 I started chatting with him... nice guy – Bob Jensen. Visit his website at http://www.bobjensenphotography.com As I pulled away another group started assembling. Must be a regular thing out there. Maybe next time I'll see if I can join in with my 8x10! Bob suggested I give him a call next time I'm in town to photograph and we can go to a few other places, like Union Station. I can't wait to go back and spend more time here. More to come from the remainder of the trip home... Salton Sea and Desert Center. Stay tuned. 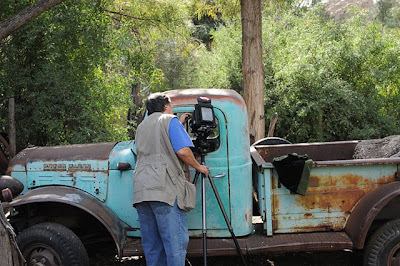 Our Large Format class with Rod Klukas had a field trip yesterday to Superior, AZ. We started out with a fine breakfast at the Buckboard Cafe then proceeded to the Boyce Thompson Arboretum. It started out as a beautiful day though towards lunchtime the light started varying wildly with fast moving clouds. Makes it kind of hard to accurately meter because it keeps changing. In any event I got some nice images and a few snaps of some classmates. The famous Larry Golsh trying to figure out who left this camera in front of his truck. 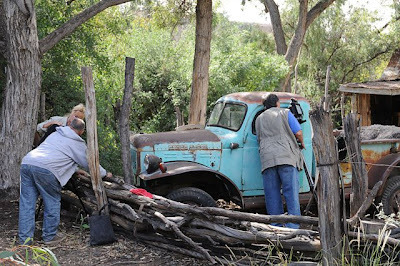 Tiffany Pacileo teaching Eddie Patelson a few things about photography, while the famous Larry Golsh still tries to figure out whose camera is blocking his truck. After lunch we went into the town of Superior. This place is a goldmine for photography. Many old buildings, murals, and other beautiful detritus. Got a few good images before the weather deteriorated. We went through monsoon-like storms on the way back, including hail and some incredible lightning in the Superstition Mountains. 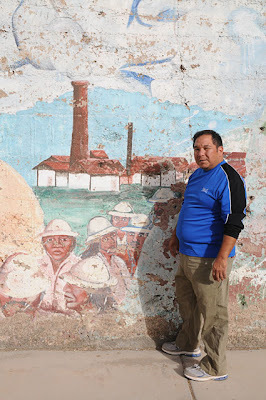 Juan Garcia with one of his previous subjects... a mining mural painted on the side of a building in Superior, AZ. 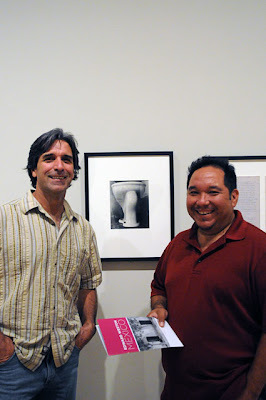 I am proud to own one of Juan's prints (below) from this series. As I respect my friend, Juan, I did not photograph the mural... in black and white. But I did make a transparency. Hopefully it will turn out. I will post images in a near future blog entry. 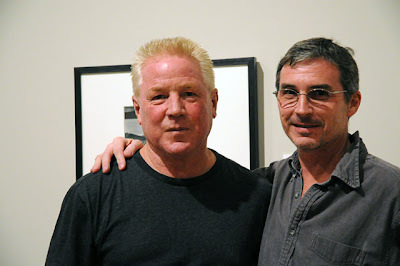 Yesterday was the artist's reception for my show at the Photomark Gallery. The turnout was fairly good... mostly friends from Rod Klukas' large format class, and a few other folks I had not met before. 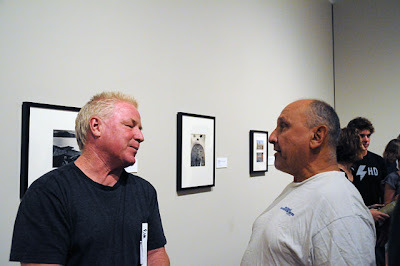 I had some interesting conversations, including one with Don Bierman, who was a staff photographer with the Chicago Tribune for 40 years. 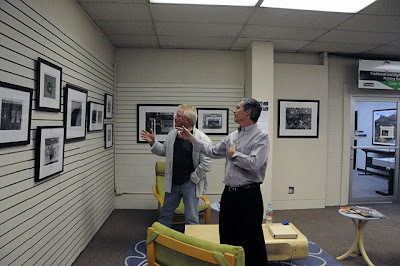 He offered insight into how photography has changed in that time, especially journalistic photography. In addition, we had a surprise visit by our friend, Kim Weston. He is in town until Sunday and stopped by with Randy Efros, Juan Garcia and Frank Ayala. 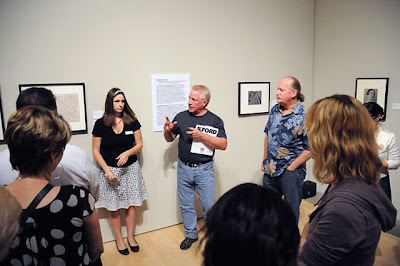 Kim Weston and I discuss the "Kelp" image, which was made at one of his workshops. I had several older (1980s) pieces in the show from the Carmel/Big Sur area and Kim and I reminisced about how some of those locations are dramatically different today. Kim had some kind words for my work, and I thank him for the encouragement. Based on feedback from visitors, the favorite images seem to be "Kelp", the "Barber Shop" and "Whaler's Cove". 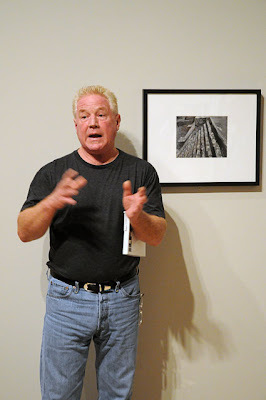 Kim Weston critiques "Foundation, Paterson, NJ, 1983". 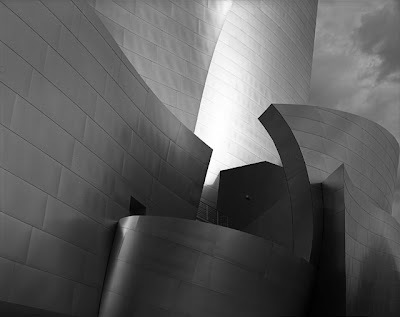 I have developed several new images from my recent trip to Los Angeles this week. As soon as I can scan the negatives and chromes I will post them here. 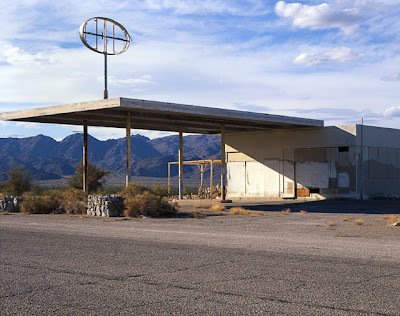 Included are the Disney Concert Hall, Salton Sea and an abandoned gas station in Desert Center. I am very excited about these images and can't wait to print them. 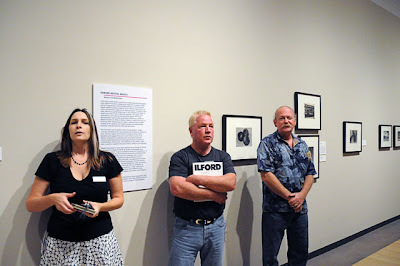 The Phoenix photography community had a special treat on November 4. 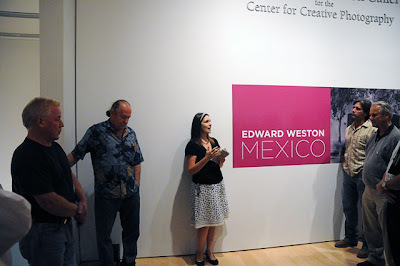 Kim Weston, son of Cole Weston and the grandson of Edward Weston was in town. 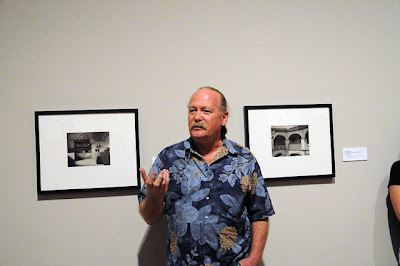 He, and Randy Efros, along with Becky Senf, from the Center for Creative Photography in Tucson, gave a walking tour and lecture on the "Edward Weston: Mexico" exhibit currently at the Phoenix Art Museum. 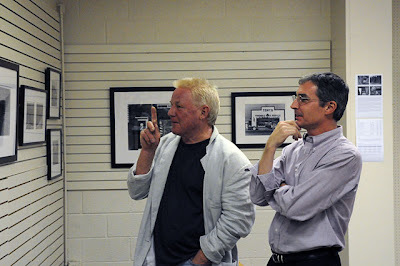 From left: Kim Weston, Randy Efros, Beck Senf. 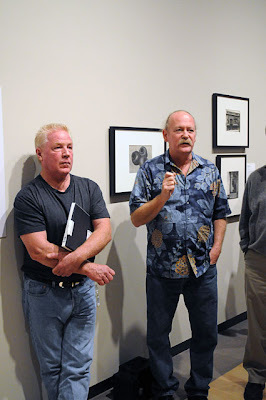 The lecture was very informative and offered unique insights into the lives and photography of Edward, Brett and Cole Weston, as well as Kim and Randy. In addition, there were many great photographers from the Phoenix area in attendance. 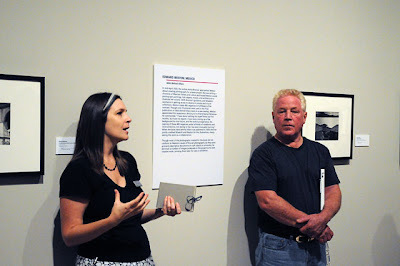 Kim Weston with Rod Klukas. Kim Weston meets Picasso... oh, that's not Picasso... it's our own Eddie Patelson! 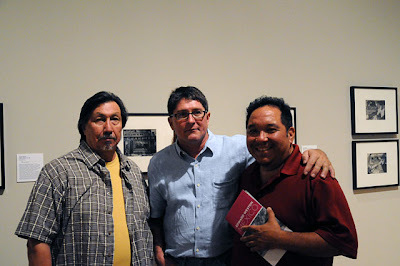 The famous Larry Golsh, John Kitts, and Juan Garcia (l to r). John Prouty and Juan Garcia look for the men's room! Yours truly with my friend, Kim Weston.